Fall is in the air and while it’s still warm during the day, the night air has a chill to it now. Yes, fall is making its presence known, and while a chill in the air might not be my cup of tea, one of the happier harbingers of autumn is the apple and apple picking time is nearly here in Upstate New York. My latest shawl, in fact, is inspired by the splendid apple orchards of Upstate, New York. 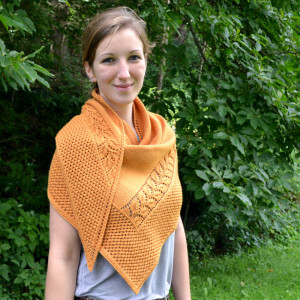 The Heirloom Cultivar Shawl is an asymmetric shawl featuring an apple tree branch inner border along one side paired with a wide basket weave border along both sides. A plain stockinette body allows attention to remain focused on these lovely border stitches. Worked in a sport weight yarn, it is perfect for keeping that autumn chill from your shoulders. This shawl is worked from the right wingspan tip (starting with a mere 2 stitches) and worked toward the opposite edge where it is bound off. As with most of my designs, I like to include a different technique in each one where possible. This shawl is no exception. It utilizes a Vikkel Braid to mirror the slip stitch border edges at a perpendicular angle. If you haven’t worked a Vikkel Braid before, I have to tell you it’s one of the most interesting knit stitches that I know of. I also had the pleasure of working with a new to me yarn this time. In my search for an appropriate sport weight, I found Quince & Co offered Chickadee. It’s lovely to knit with, offers great stitch definition and is soft to the touch. The lovely shades that it comes in and the fact that it is sourced and spun in the US are just added bonuses! So, if you are looking for an interesting knit (there is something going on in every row! ), that is easily customized for size and has a bit of pretty knit in as well, Heirloom Cultivar may be for you! Full pattern details for the Heirloom Cultivar Shawl can be found here.